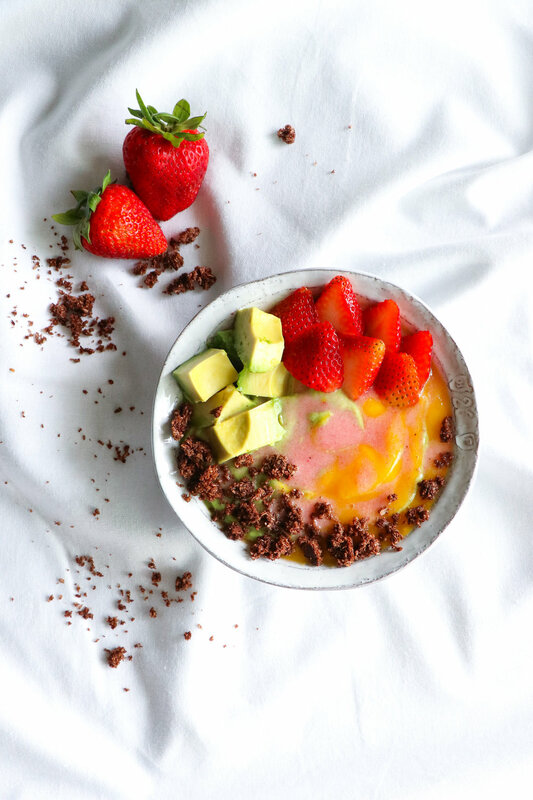 This smoothie bowl is a combination of three smoothies in one; one sweet, one tart, and one savory. They taste so fresh and healthy individually, but together make the most delicious meal. I added some crumbled chocolate macaroon that I had made earlier this week, but that is totally optional. If you choose to you can crumble some of your favorite cookie on top. To create a half-half bowl, pour two of the smoothies in from opposite sides of the bowl at the same time. Decorate with flavors from the smoothies; fresh avocado cubes, strawberry slices, grated ginger, diced mango, or whichever fresh ingredients you prefer.